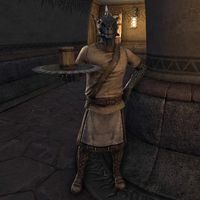 Weedum-Eius is an Argonian servant who can be found in the Saint Olms Waistworks in Vivec City. He stands with Methal Darithran and Ravela Selandas on the east side of the walkway above the central plaza. He has no unique dialogue.